Giving Homage to The Ancestral Spirits of Music & Dance. With your Host and Selector, Aphrosoul (MOJÙGBÁ, BKNY/DC). Taking you on an atmospheric musical journey of the mind the body and the soul, from the soul. Giving Homage to The Ancestral Spirits of Music & Dance, through the Afro Diaspora. Soul, Jazz, Funk, Disco, House, Tech, Afro, and beyond. 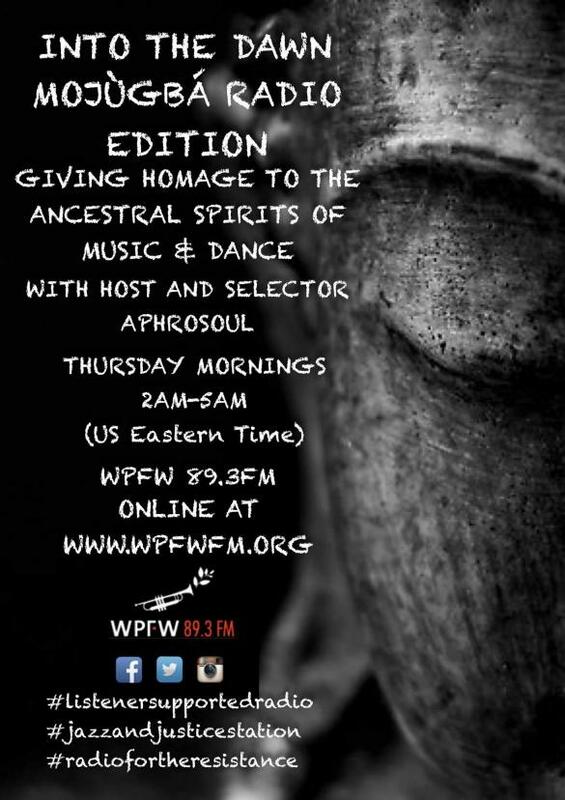 Thursday mornings 2AM-5AM (US Eastern Time), on WPFW 89.3FM. No matter where you are, you can also listen from across the globe, be it national, international, continental, intercontinental and beyond at www.wpfwfm.org, 2AM-5AM (US Eastern Time Zone), time zones vary across the globe. Tune in, align, connect, and vibe.